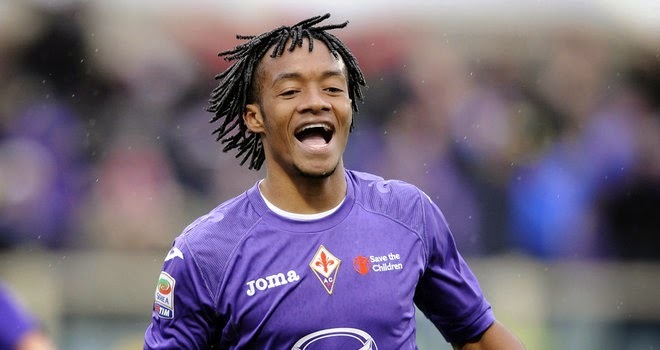 Juan Cuadrado: £27m is what it's going to take. Should we pay it? In the past few days, you have all read reports of Chelsea's "interest" in Fiorentina's Juan Cuadrado and the reported first bid by Chelsea of £20m being rejected. Now, speaking to the Italian clubs Website, President Andrea Della Valle has revealed the fee to be paid to release the Colombian from his contract despite hoping that he would remain in Italy beyond this current transfer window. 'The buy-out clause is there. We put it (buy-out clause) high in order to keep him (Cuadrado). It's a strange but very public move from Fiorentina. Why on earth would you publish the figure to release a player from a deal with you if you want him to stay? I can only imagine that the player and his agent have come forward and told Fiorentina that they would like to leave so they are throwing the figure out there to see if anyone wants to match if even if at this stage, Chelsea do not? As you can see he is pacey, two footed, has an eye for a goal and has a fair bit of skill about him. I do however question whether or not he would put a shift in without the ball which after all, is what the manager demands from his players in those wide areas. Do you think he is worth £27m and would he succeed in the Premier League?